I have a confession to make. Well it’s not really a big deal… unless you’re a blogger. I love Fall, but I’m not so crazy about doing a lot of decorating for Fall. Well a lot of the orange color looks great in other blogger homes, but it doesn’t go so well in mine. So I decided to make it work for me, and here you go. I think you need to go with what works in your home. The first thing I did was buy some Fall things. I bought the pumpkins at a discount store. Then I got out my paints and painted away. I used a white chalk type paint. It took a few coats, and then I was done. I trimmed a bush in my yard and used the cutting for part of my display. And I found some fresh sunflowers that made me happy. I had a bunch of pumpkins. I added many of them to this dough bowl, that I also filled with moss and dried flowers. I was very happy that I was able to find a way to decorate for fall that worked with my decor. Painting the little pumpkins took a few minutes, and then I was free to arrange my goodies. I grabbed a large dough bowl, the blue enamel pitcher for the flowers, and the blue pottery baking dish shown above. This is a good way to save money. 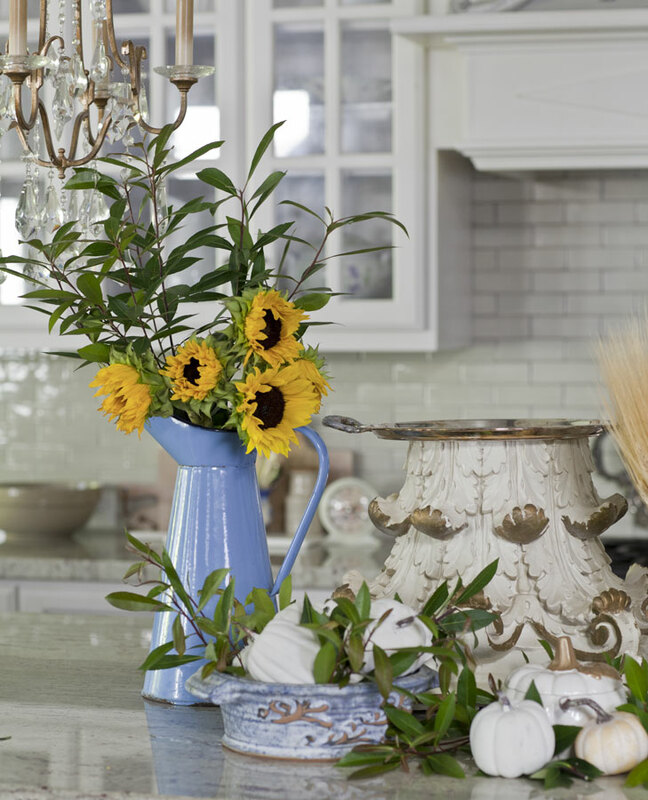 Add your seasonal things to items you already have in your home. No need to buy a new container for the pumpkins, you can use what you have. Some things went in my kitchen and some in my dining room. I spread them out in my home. Below I have chosen some of the items I used and a few more that would go with this look. These are affiliate links. Click on them to see more information about the items I selected. 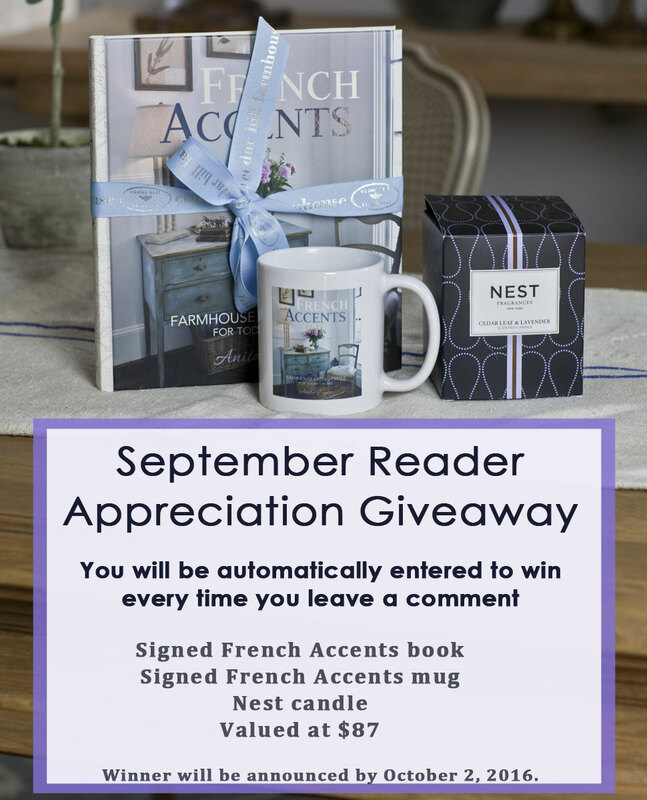 And be sure to leave a comment so you’ll be entered to win my contest. Fine print here. 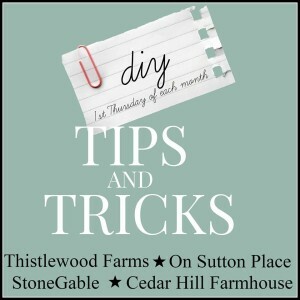 This is part of my DIY TIPS AND TRICKS monthly event. I sure hope you’ll check out what my friends are cooking up today. 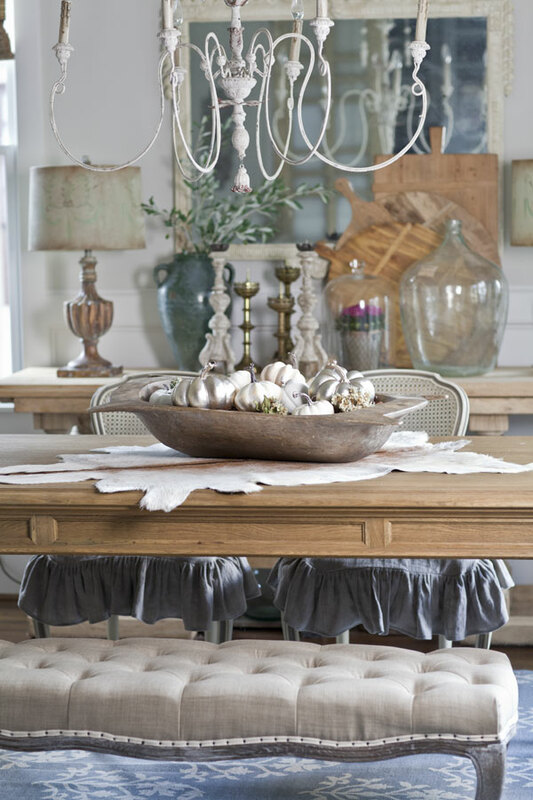 Beautiful vignette and table Anita…cannot wait to bring out my Fall decor. I love your simplicity. For those of us that are not designers it is hard to find time to completely overhaul our homes each season. Thanks for sharing. 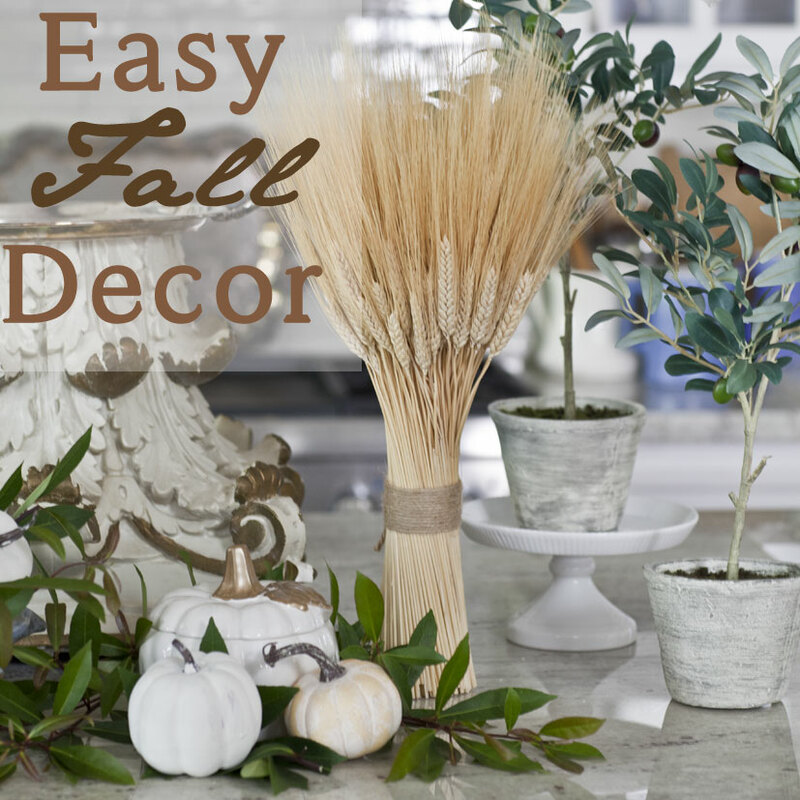 Your Fall decor looks beautiful! I’ve been decorating all week. I love Fall! I hope that you have a wonderful day!!! Yesssssss!!! 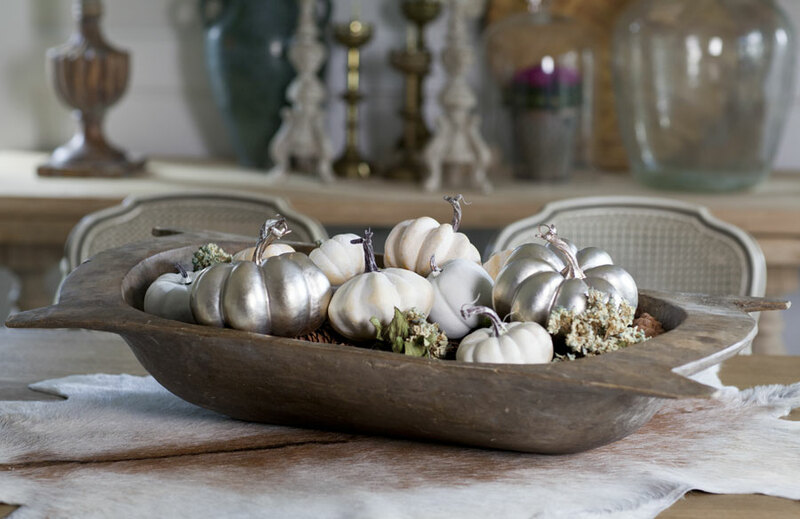 Love the neutral fall decor …so much better than the orange for my home too! Very nice! I do the same…no orange here. Hadn’t thought about painting the orange pumpkins white, though (I was buying the white ones) Great idea. Love your ideas. I think I will be painting some pumpkins very soon! Here in south Florida, all my Fall has to be “imported”! Thanks for the tips! Love the painted pumpkins. I think I will do that for my dining room. You always have the best ideas! It is too hot in Florida to do the fall things shown in most blogs and magazines but this will work. Anita, this looks beautiful! 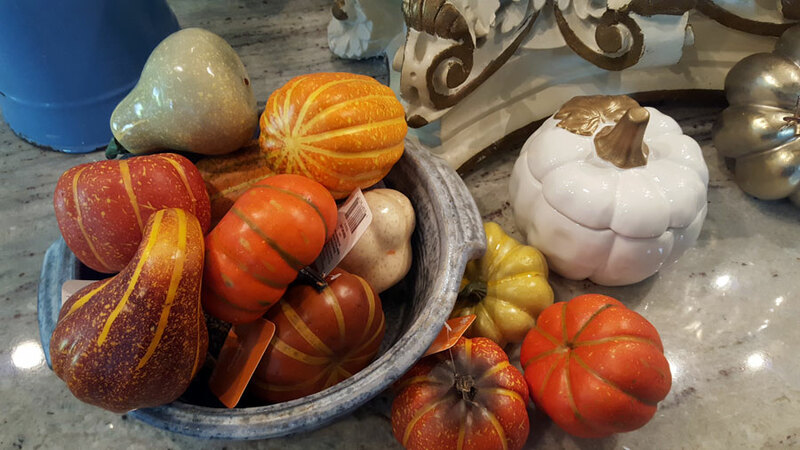 I am usually one to decorate our home with neutrals, as they blend so beautifully with the French Country antiques, this year I added a touch of pumpkin color ( wild me!) and do love it. I love how you incorporated fall decor to fit your home and decorating tastes! My favorites were the neutral and “glam” pumpkins in the dough bowl!! Thanks for sharing! I have warm colors in my home, so the typical fall decor (at least most of it!) goes well. However, I’m open to trying to new things and I really like the look of these neutral pumpkins! Blessings to you…. I love the way you decorate dear friend! Gorgeous! I thought I might spray paint my pumpkins and gourds this year with mirror paint. I’ll keep you posted on that project. I love this idea! I don’t care for orange in my home either so I am heading out to find pumpkins to paint. Thanks for always inspiring!! What a fabulous idea. Orange doesn’t go well with my decor either. Thanks for the tip! Thanks for sharing! 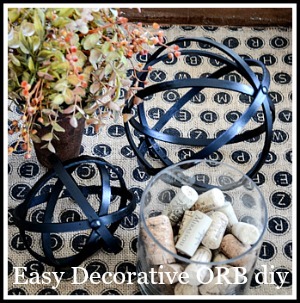 Easy, affordable way to ‘add’ to my décor without going overboard! 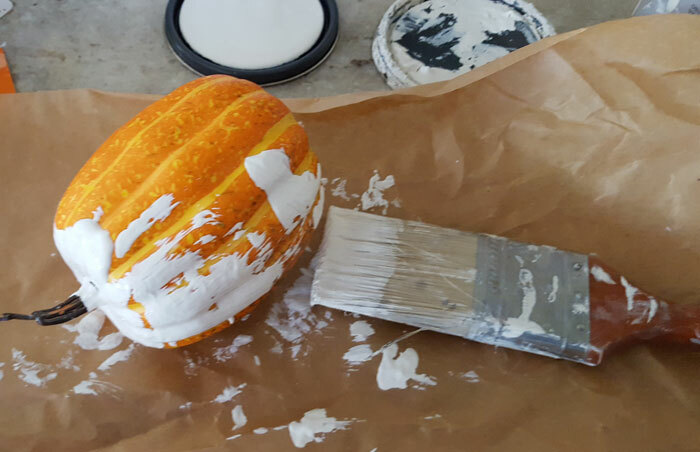 Believe it or not I have never painted pumpkins…yours turned out so great that I am going to give it a try. 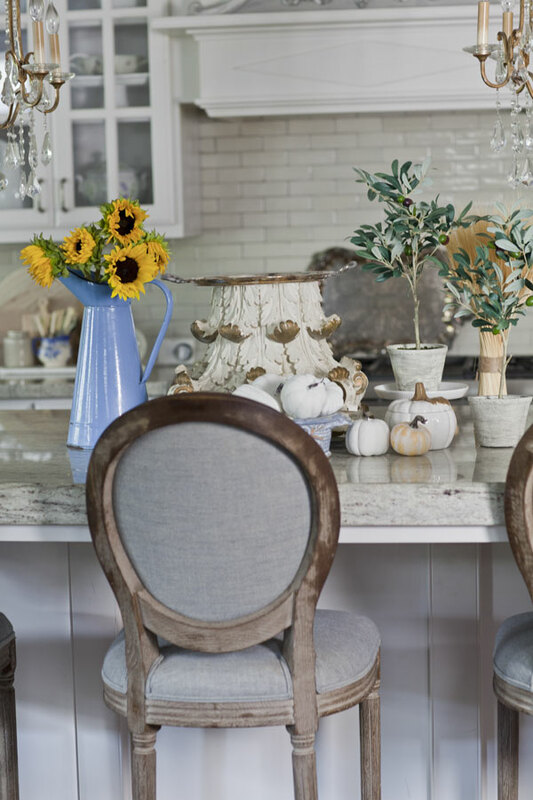 I love how you found a way to decorate for fall without compromising your personal style. Well done! Great job as usual Anita. We’re on the same wavelength for color this fall. Using white pumpkins I already had, but didn’t think to use my always on hand white chalk paint for all the little faux orange pumpkins. I’m not sure why I didn’t think of it myself, but that’s why I have you! I always forget what a little paint can do. Thanks for sharing… Such inspiration. Thanks for the creative ideas! Have loads of fall items, but never could put them together to look great. Now I know how to put them to beautiful uses. Thanks!! Thanks you, Anita, for the continued inspiration! Can’t wait to try the painted pumpkins! Now I know what I will be doing with all those orange pumpkins! Painting them! Thanks for sharing. Hi Anita! I love the white! What a clever idea. You just gave me permission to put out the pumpkins, though it was 100-ish north of Dallas. The girls will be so happy that we are inaugurating fall. Have great week! Orange doesn’t work in my home either. I love the neutrals. Thanks for sharing. Hi Anita, your pumpkins turn out great, I have soft colors in my home for the fall season, I love velet pumpkins as they come in a variety of colors….. I love this Anita, and I couldn’t agree more! I even wrote a post today about loving white pumpkins – and how until they appeared a few years back, I never wanted to decorate because the orange didn’t go in my house! That was a really cute and quick project! I’ve been reading blog post all week showing such beautiful fall decor. TIME TO GET TO WORK, LOL! Your vignettes are lovely. Love the idea of painting the pumpkins! 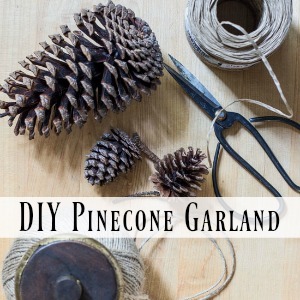 I haven’t been motivated to pull out my fall decorations but now that I’ve read your blog you’ve give me some ideas and I’m ready to get started decorating. ? Orange is not allowed on our property,,,well except for the honeysuckle that was labeled “red honeysuckle” and turned out to be orange. It’s still here. I love your subtle approach. I try to do fall with purple and dark reds and rich browns. I always have a hurricane vase full of the little white pumpkins to at least include the pumpkin shape in the mix. Don’t you love that God provided us with this amazing collection of things to choose from so we can all celebrate this beautiful season, our own way? L o v e your painted pumpkins, dear friend! Elegantly styled within your dough bowl! I, too, like the “softer” hues of Autumn! This is a happy time of year! Thanks for all the great ideas for fall decorating! Love the idea of painting pumpkins. I am like you orange doesn’t look so good with my décor. Your arrangements look quite chic. 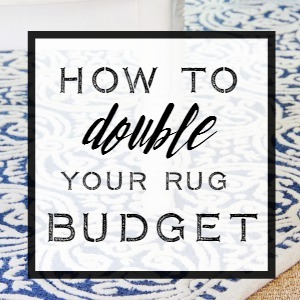 I am a budget decorator always looking for a way to save. Thank you. I’m new to your blog and love your style. I have painted real pumpkins before but also have some artificial that I think I will paint this year. While I love traditional fall colors they aren’t suited for my home either. Love your look. I chalk painted and waxed pumpkins last year in soft blues, whites, creams, and a light green. I got tons of compliments, and made a set for a friend’s birthday! Your arrangements are stunning. Beautiful pieces. I will be getting my silver and white spray paints out today! Thanks for the inspiration. Love Fall decor! Love the dough bowl filled with pumpkins! a real frashionista for my home!! TY TY TY!! Thanks for your ideas as the traditional fall colors dont look well in my home either. Great ideas. I love your fall decor, Anita! I am really loving the look of the white pumpkins so many are using this year. I like a little of the traditional oranges and browns for fall, but I think enhancing them with the use of white is very attractive. I’m going to shop for little pumpkins this week! And haul out my dough bowl! Absolutely love your style and the natural elements you weave in. 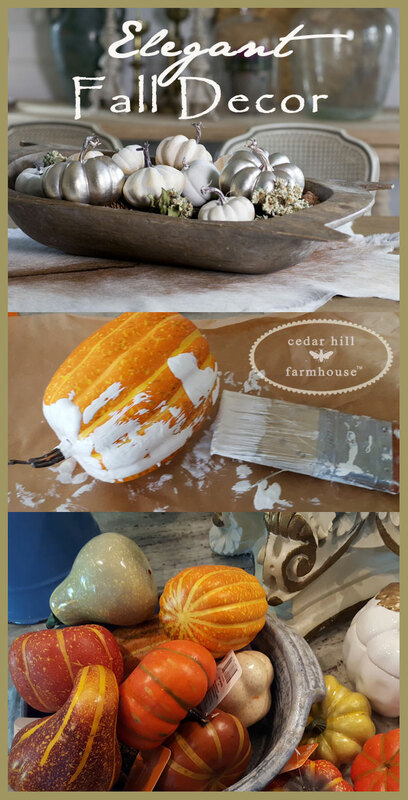 Pumpkins painted in chalk paint! Love the neutral scheme. Thank you! You make the painting look easy. Orange doesn’t work very well for me either. I need to buy some chalk paint. Pretty yet simple..Thanks for posting. Your Fall accents are extraordinary! Really gets me in the mood! Wow! I love the look of those stitched pillows! I wonder if I could make one like that? A few miles from my home is a truly lovely plant/decorative planter store. On a monthly trip I saw the small pumpkins/gourds with sheer wired ribbon bows, two colors added to the tops of the pumpkins. I am trying to change to blue and white gradually, so purchased apple green, silver and gold ribbon. Today my project is to take these small orange/green items and top with the ribbons. Will let you know how they turn out! Love the painted bargain pumpkins. They look great. Will give this one a try. Thanks. Your home is beautiful. I have a bin labeled Autumn full of mostly things from nature to pull out for decorating. Last year I dried a bunch of gourds and some on them are on my coffee table in an old wooden box. Thanks for posting great stuff. I’m with you! I’ve never like orange and it just doesn’t look right in my house. I’ve often thought of painting my pumpkins and now I know I will. Thanks for the prompting to go for it! I’m new to your blog. I came over by way of StoneGable. I think you call actually grow white/pinkish pumpkins, but I have not tried it yet. Painting is the next best thing. Thank you for these great ideas! I’ve always tried to use fall decor that leans toward the burgundy and darker russet shades, but love the look of the white pumpkins! I foresee painting of pumpkins in my future! Hi Anita, your fall centerpiece is just lovely and you just reinforced my long held position that I NEED a dough bowl. Need to redouble my efforts there. Thanks for sharing your lovely decorating ideas. I love the white pumpkins as well. They would work with any decorating style or colors! Such a refreshing change from orange. Very cute pumpkins in the end and they look lovely in your decor. Thanks for the inspiration, I love your style!! Thank you for the ideas. Orange doesn’t go in my home either and to tell the truth I really don’t like the color. I am going to start painting my pumpkins white and set with other earth tone items. You have inspired me to decorate for fall and to visit the dollar store to buy pumpkins. I like your idea about painting the pumpkins — silver will work better in my home as well. Thanks Norma! You are so kind. Great idea! A way to use my (ugly) old orange ceramic pumpkins – I’ll be looking for chalk paint later today. Love the way your fall table looks. You, you’ll love the new look Fran! I love your fall decorating. It is a nice and cool 49 degree fall day here in Idaho and I am dressed all warm and cozy as I read your blog. Thank you for sharing with us your wonderful decorating ideas.